Google today launched a new website that provides more information about Google TV and its apps and all of the other features of Google TV. One of the goals with Google TV is to open up the living room and enable new innovation from content creators, programmers, developers and advertisers. By bringing Google Chrome and access to the entire Internet, one can easily navigate to thousands of websites to watch your favorite web videos, play Flash games, view photos, read movie reviews or chat with friends—all on the big screen. More at: The Official Google TV Blog | Google TV website. 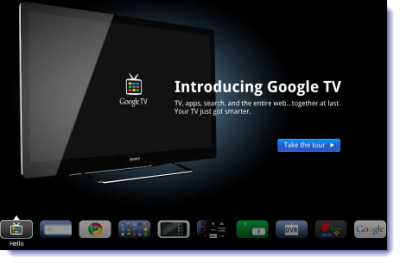 I like the whole concept of Google Tv but not sure if it’s gng to move one step ahead of Apple TV. I know they have an advantage of Google voice but again apple launched the Facetime which is also equally good..
It’s gng to be fun seeing battle between these two….